When the USA Hockey staff went about picking the roster for its selection camp for the 2014 IIHF World Junior Championship, one of the buzzwords was versatility. "It's important to show that you're a versatile player, and on this roster you're going to see a lot of guys who can play a lot of roles with the team," said Jim Johannson, general manager of the U.S. WJC team and USA Hockey assistant executive director for hockey operations. "That's always helpful in short tournaments and not knowing injures and all those things." Although there isn't a proven dynamic performer among the 26 players invited to the camp, which will run Dec. 15-18 at the University of Minnesota, Johansson and coach Don Lucia believe the seeds are in place for a strong showing when the WJC starts Dec. 26 in Malmo, Sweden. "I like the group we have," Lucia said. "This summer we had a pretty good feel of the group, what their strengths are. We have a team that can get up and down the rink, I think we'll have a team that will compete hard shift in and shift out. "You have to have flexibility in your lineup and that's one of the things we're looking for, guys who can play multiple roles, guys that can play center or a wing position. Those are things that are going to be very important if a guy goes down with an injury or you have to readjust your thought process of what you think should happen as the tournament goes on. I like our group." 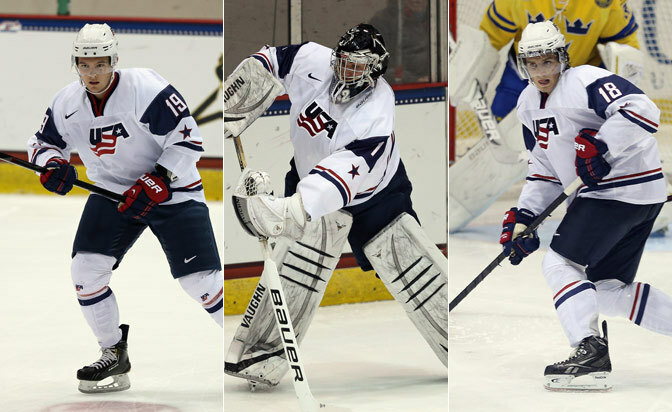 Among that group are three players who were part of the United States' gold-medal winning team at the 2013 WJC in Ufa, Russia: forwards Riley Barber and Ryan Hartman and goaltender Jon Gillies. Barber, a Washington Capitals prospect, is in his second season at Miami University, and is third among NCAA players with 24 points in 16 games. He had three goals and three assists in seven games at last year's tournament. Hartman, a Chicago Blackhawks draft pick who missed the summer evaluation camp in Lake Placid, N.Y., while recovering from a shoulder injury, has 21 points in 20 games with the Plymouth Whalers of the Ontario Hockey League. He had two goals and an assist at the 2013 WJC. Gillies, a Calgary Flames prospect who played one period at last year's tournament as the backup to John Gibson, is tied for third among NCAA goalies with 10 wins to go with a 1.81 goals-against average and .911 save percentage in 14 games at Providence College. "Those guys were a big part of the team last year and we expect some leadership coming from them," Johansson said. Based on his play this season and his tournament experience, Gillies could be the favorite to enter the tournament as the starting goaltender. 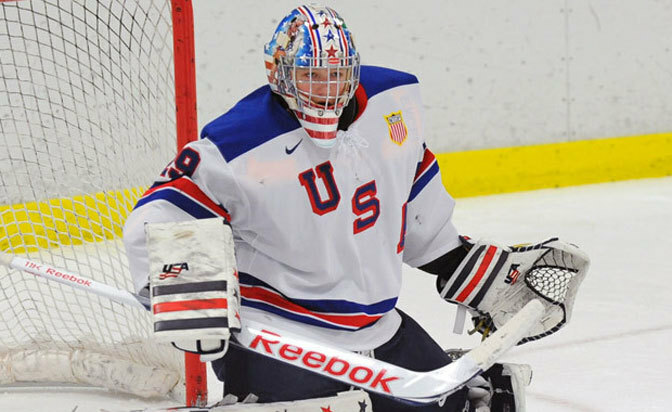 Also picked for the camp was Anthony Stolarz of the London Knights of the OHL, and Boston College freshman and top 2014 NHL Draft prospect Thatcher Demko. Those were the final three goalies at the summer orientation camp. Lucia said based on age and high-level experience that Gillies and Stolarz had "a little leg up now," but said the selection camp in Minnesota -- which will include an exhibition game against Minnesota State-Mankato -- and pre-tournament games in Sweden will be the deciding factor in which two goaltenders make the final roster. "You go in with certain expectations but at the same time you're going to have to play your way into spots," Lucia said. "He [Gillies] was on the team last year, he's had two very good years at Providence, but I thought Stolarz was very good this summer at camp. Demko is the youngest of the three, but he's done a nice job at Boston College this year and had a pretty good camp this summer. That's one of the things you want to let it play itself out. We'll have three exhibition games to make further evaluations on these guys. … That's what you have the camp for, to evaluate." Defense, a position of strength last year for the U.S., will have no returning players from last year's tournament. Jacob Trouba, voted the tournament's best defenseman, is playing a big role as a rookie with the Winnipeg Jets, as is Seth Jones, who was second to Trouba in scoring among American defensemen last year with seven points but now plays for the Nashville Predators. Patrick Sieloff, considered a lock for the team's top defense pair and potentially the captaincy, will not be available for the tournament. The Flames prospect, playing with the club's American Hockey League affiliate in his first professional season, hasn't played since Oct. 5 due to an infection. "He's going to be missed, no question," Lucia said. "He was very good this summer. I had been [to Lake Placid] two years in a row and I was impressed by the growth of his game. I thought he was a tough, physical, rugged defenseman, but I thought his decision-making and stick skills really improved over the last year and he would have been counted on. But at the same time we know we don't have him and we like the group we do have. It's another opportunity for somebody else." Among the players that could fill his spot is Anthony DeAngelo of the Sarnia Sting of the OHL, one of the top defense prospects for the 2014 draft. The 5-foot-10.75, 175-pounder leads all OHL defensemen with 39 points in 27 games. He was invited to the summer camp in Lake Placid but was among the players sent home when the roster was reduced. "He's got special offensive skill," Lucia said. "He showed that at times at Lake Placid. He's a younger player, so you have to allow their game to grow. We all know how important specialty teams are at the World Junior tournament and he has that special talent on the offensive side of the game. It's a great tool for us to evaluate these four or five days in the Twin Cities to see if he can help our team in those elements of the game." Another younger player with a chance to make the club that goes to Sweden is 17-year-old Jack Eichel, who is eligible for the 2015 draft. The 6-2, 193-pound center leads the United States National Team Development Program Under-18 team with 17 goals in 19 games, and his 35 points are second. Johannson also said he thought Eichel was the best player on the ice at the Four Nations Tournament in Finland in November. "I think he's an absolutely dynamic offensive player, but also a guy physically ready for this level," Johannson said. "This is going to be a hard-working, skilled team that's not a dynamic offensive team. Jack Eichel is a dynamic offensive player. Regardless of his age we think he's ready for this challenge, and that's why he's coming." Johansson said there could be other players added prior to the start of camp, and there could also be a roster trim-down prior to the team shifting its pre-tournament activities to Angelholm, Sweden. "In a perfect world, for planning, we'd like to get down to a player or two less prior to going over to Europe," Johansson said. Among the players invited to the camp, two already have made their NHL debuts: Capitals defenseman Connor Carrick, who played three games this season, and New Jersey Devils forward Stefan Matteau, who played 17 games last season. Both are playing junior hockey this season, but their NHL teams had no reservations about allowing them the chance to play at the WJC. "We particularly appreciate the cooperation of the Devils and Capitals in releasing their players for the camp," Johannson said. The U.S. defeated Sweden in the gold-medal game at the 2013 WJC to win its third tournament championship. The Americans outscored their opposition 15-2 during a three-game roll through the medal round, defeating the Czech Republic (7-0), Canada (5-1) and Sweden (3-1). The 2014 WJC will run Dec. 26 through Jan. 5, 2014. The U.S. will play in Group A, with Canada, Czech Republic, Slovakia and Germany. Silver medalist Sweden heads the Group B field, with Russia, Finland, Norway and Switzerland.